Avram Iancu Hall Ruschita has marble floors, white marble decorative red and beige Moneasa Rafters. The walls alternate "mirror" of decorative plaster, stucco plaster with floral elements and Ruschita white marble pilasters, fluted. Presents decorative plaster ceiling, with a groove on the central area, which aims to room configuration. Avram Iancu Hall has an area of 450 square meters and a capacity of 61 seats. The technical facilities include a conference facility enhancement and simultaneous translation booths. Until 2004, the hall was used for meetings organized by the International Conference Centre, the Chamber of Deputies. 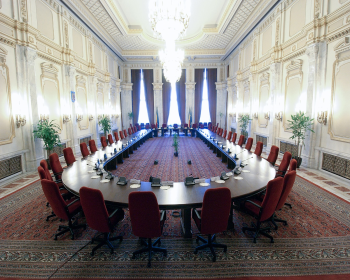 After 2005 it was used mainly for meetings of the Permanent Bureau of the Senate and occasionally for meetings with foreign delegations of the Romanian parliament. Currently, meetings are held here standing bureaus of the Chamber of Deputies and Senate combined.